F.R.I.E.N.D.S fanatics assemble, dressed in black and in a state of mourning. One super fan has created a 14-minute alternative ending to the best sitcom ever made (IDST); but this is no cause for celebration. The dark episode sees the tragic death of Chandler Bing, known to his loved ones and the people at the TV Guide company as Ms. Chanandler Bong. The expertly spliced alternative episode – aptly titled ‘The One Where Chandler Dies’ – opens with Chandler running through the streets of New York, presumably dashing to Central Perk before his goldfish bowl of coffee goes cold. 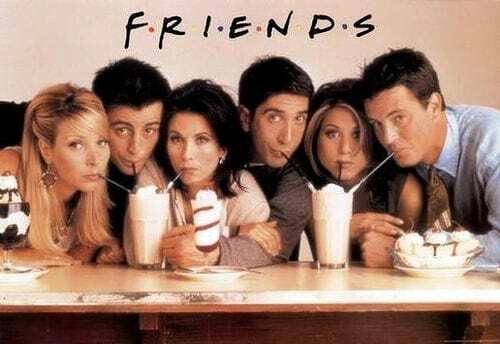 As we hear a loud crash – eerily reflecting the famous claps of I’ll Be There For You – the opening credits end with Monica, Rachel, Phoebe, Ross and Joey piled onto the couch. Cut to the now-five friends attempting to deal with the sad, sad loss. Although the group never really figured out what Chandler did for a job (it definitely wan’t a ‘transponster’) and never noticed that he wore glasses, this sad episode shows just how loved Chandler was by all. What the friends really need is someone to make an awkward and inappropriate joke to break the sadness. But their in-house wise-cracker is gone. No more J-man and Channy. …Or that’s what you thought. As the episode unravels into chaos, with Monica resorting to alcoholism and crack addiction and Joey and Ross forging a new bond, Chandler looks on from heaven. When Monica eventually takes solace in Joey’s arms, Chandler returns to Earth as a ghost to haunt his five former friends for their betrayals. Thankfully, like all good sitcoms, there’s a touching montage and things end on a high thanks to some crafty imagination courtesy of Dog Food Films. While the alternated ending is an impressive feat of editing, which includes clips from 125 of the 236 episodes ever made, I am not ready to forgive the guy that killed off Chansey. F.R.I.E.N.D.S fans have just about recovered from the disturbing thought that the six characters could all just be a figment of Pheobe’s imagination, and now this? Who’s going to mush the Chanberries into a delicious Thanksgiving sauce now?